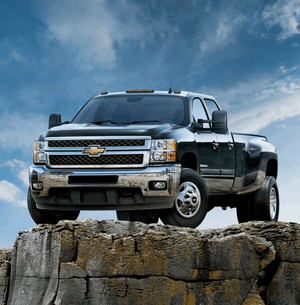 Over the next few weeks I will be outlining 11 reasons why the new 2011 Silverado Heavy Duty truck will crush any other heavy duty truck on the market. I have studied this truck…and have studied this truck…and for a change of pace, I have studied it some more…and I can not find a single job that this truck can not do – and I want nothing more than to share all of its glory with you! Comprised of the broadest lineup of Silverado Heavy Duty trucks Chevrolet has ever provided, the new 2011 Silverado HD has something for everyone – literally. There are 19 models available, with 3 different trims to choose from, and a ‘Silverado-Extended-Cab-full’ of features for you to think about. Jim Campbell, Chevrolet’s General Manager, made sure that Chevy “…sought the input of [its] customers during the development of the 2011 Silverado HD to deliver a truck that meets or exceeds [the customers’] every need”, and, “…offers greater strength and capability – including class leading fuel economy, trailering and payload ratings – and has more power, accelerates quicker and has lower emissions” to those customers. The engineers determining the design of the HD’s frames were extremely attentive to its common customer and after uses. So much that they added access holes to the rear frame section for easier installation of 5th wheel or gooseneck style hitches and made sure that the frame mounted hitch for conventional trailering was stronger (made with a box-tube design), supporting up to 16,000 pounds. Eleven all-new, fully boxed, frames have been engineered to improve durability and ride, while also supporting increased capability. The engineers added hydroformed front sections, increased cross sections and used high-strength steel for greater durability, higher towing capacity and improved ride and handling. The frames can bend up to 92% and 20% more, respectively, with the fully boxed sections enhancing torsional stiffness by a factor of 5. Be on the look out for reason #2!